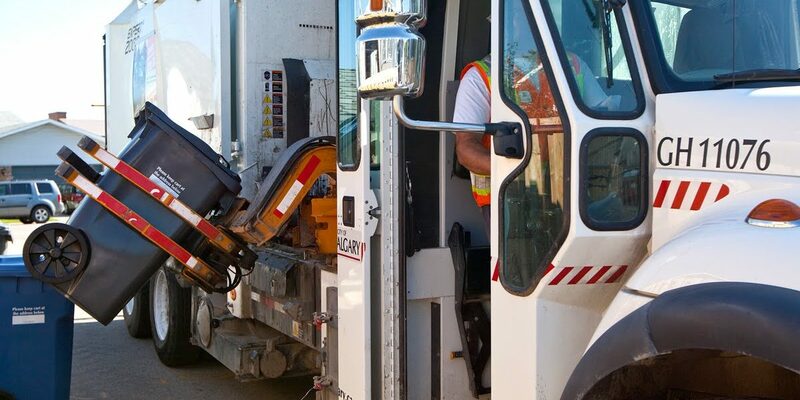 How does waste collection work in Calgary? From left to right: garbage, recycling, and compost bins. The City of Calgary is responsible for picking up and emptying waste collection bins once every 1-2 weeks. Every neighbourhood is assigned a certain day of the week where this will happen. You must place your bins at least 60 cm apart, before 7 am on the day they will be emptied. Black, blue, and green bins will stay either in your back lane or near your garage or parking space. 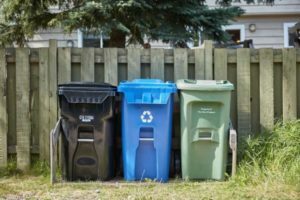 It is your responsibility as an owner or tenant of the house to make sure your bins are in good condition. Your black bin is the place where you throw away garbage. These are household items you don’t want that cannot be recycled (blue bin) or composted (green bin). Your black bin can hold up to 4 regular filled garbage bags. If your cart is full and you cannot close the lid, you can set extra garbage bags 60 cm to the side of your bin for collection. To read tips on how to take care of and place your black bin for easy pickup, click here. Blue bins are the place where you put items that can be recycled. Recycling some of your waste keeps our landfills from filling up too quickly and makes for a greener planet. To use your blue bin, put your recyclable items directly in the bin (without putting them in a bag first). If the item previously held food or other liquid waste, rinse the container out first. For more information on the Blue Bin, visit here. A PDF guide on what can and can’t be recycled can be found here. Your green bin is the container that collects food waste and scraps from your home. Putting food waste into the green bin prevents it from going to the landfill, where it is difficult for the food to decompose. The waste instead gets sent to Calgary’s composting facility, where it is turned into recyclable and earth-friendly organic matter. To find out how to use your green bin, click here. For a list of foods and materials that you can put in your green bin, click here. A poster version can be found here. Click here to learn more about how the City’s Green Cart program works.